As we mentioned two days ago, an update was just released that brings a lot of new fixes and features to the rate engine. We did a large overhaul of the rate engine last year, but there were still a few scenarios it didn't accomodate (and a few pesky bugs that remained) so we spent the last month overhauling it again. Before going over the specific details, I'd like to first give a high level walk-through of the new look and how the features are organized. An entirely new design has been created that will, hopefully, make rate periods and charge types much easier to understand and use. 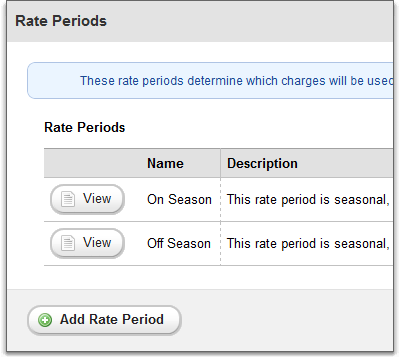 The overview page now shows all your rate periods together in one simple table. You still have the option of using a 'default' period, but it won't be called out as something more important (or more often used) than any other period. Like before, 'default' periods simply run if you have dates that fall outside of all other periods. 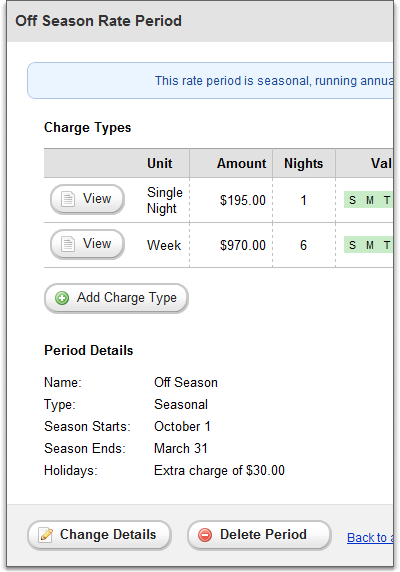 If you click through, you'll notice that each rate period now shows their charge types and details in a nice summary page. A 'charge type' is the unit of measurement by which you bill a guest for rent. Common charge types are Single Night, Single Weekday Night, Single Weekend Night, Weekend and Week. From the period summary page, you can either change the period details, add or view charge types or delete the period entirely. The options are laid out in a way that is easy to follow. If you click on a charge type, you'll notice all the details for that charge type and options for changing or deleting them. The details that are shown, whether on the view page or add/edit page, depend on what kind of charge type you're looking at. For instance, if the charge type is 'Single Night', the number of included nights isn't shown because that number would always be 1. However, if the charge type is "Week", the number of included nights is showing because you may want to specify a 6-night week versus a 7-night week.